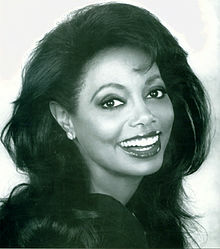 LaRue was born in Plainfield, New Jersey, United States, but moved to Glenside, Pennsylvania when she was young. She began her musical education studying dance and violin. Her family moved to Los Angeles, California where she earned an Associate's Degree in Music from Los Angeles City College. She later received a Bachelor of Arts in Elementary Education from California State University. LaRue performing at Eastern Michigan University in 1970. In 1966, LaRue was approached by Lamonte McLemore and Marilyn McCoo to join their recently formed group the 5th Dimension. 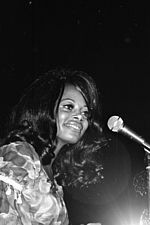 LaRue nearly always sang female lead on one song per album, with McCoo taking the lead on one song as well; otherwise she sang the alto voice parts along with McCoo's soprano, being featured prominently on Stoned Soul Picnic, or shared the lead with McCoo on songs including "Blowing Away", "Puppet Man", "Save the Country", and "Sweet Blindness". After McCoo's departure, LaRue was lead singer on hit songs including "Love Hangover" (1976). She appeared in the CBS movie of the week Happy with Dom DeLuise. She also performed in the national tour of Broadway's Tony Award winning musical Ain't Misbehavin, starred in the Toronto and Calvary productions of Mo' Magic. In the past, LaRue co-hosted the Arthritis Telethon with Jane Wyman, judged two segments of Puttin' on the Hits, appeared as a celebrity guest on Star Search, and been a special guest on numerous television shows, including several appearances on The Dale Evans Show, The Today Show, The Carol Lawrence Show, and numerous other Christian and secular programs. As of April 2009[update], the group was touring as "Florence LaRue & The Fifth Dimension" led by LaRue with Willie Williams, Leonard Tucker, Patrice Morris, and Floyd Smith. She is married to Laurence P. Kantor. She was previously married to Errol Aubry, Marc Gordon, and Bennett Curland, with one child from her marriage to former manager Gordon. In June 2016, LaRue and the group performed in The Villages, Florida, just days after the 2016 Orlando nightclub shooting. LaRue took the opportunity to share her thoughts on the events: "We will not be terrorized. We know what’s happening in the world, but this is a song about good health, love, peace and happiness. We still believe in those things today," she stated before performing one of the band's hit singles, "Aquarius/Let the Sunshine In". ^ Brooks, Brandon I. (25 June 2009). "The Center of The 5th Dimension". Los Angeles Sentinel. ^ Charleston, Rita (12 October 2012). "Florence LaRue still soars with the Fifth Dimension". The Times Herald. ^ "Florence LaRue Biography". Florence LaRue. Retrieved 2014-05-24. ^ "Official Website of The 5th Dimension featuring Florence LaRue". The 5th Dimension. Retrieved 2014-05-24. ^ "5th Dimension's Florence LaRue charms sold-out crowds at Savannah Center". Villages-News.com. Retrieved 2016-08-25. Wikimedia Commons has media related to Florence LaRue. This page was last edited on 29 January 2019, at 23:22 (UTC).